Find and Book a Hunting Trip with Professional, Pre-Screened Illinois Hunting Guides / Outfitters. Trophy Whitetail Deer, Eastern Turkey, Varmints, Waterfowl, and Quail top the list of the most sought after game in the the Prairie State. We'll help you find a professional Illinois Hunting Guide / Outfitter for your next hunt, simply click Find A Hunt or select a gun or bow below after reviewing the Illinois Hunting information. Pike County, Illinois - many a deer hunter's Nirvana. While Pike County and the surrounding Golden Triangle region continues to live up to it's reputation, big-bodied heavy horned trophy whitetail deer are found throughout the state. Legal weapons for deer hunting include muzzleloader, shotgun, and bow. Tags must be drawn thru the state's lottery system, but are relatively easy to obtain for all weapons. With an estimated 750,000 deer in the Prairie State, a hunter has a great chance to bag a nice whitetail, maybe even one for the record books! Other top hunting choices in the Prairie State include abundant eastern wild turkey, bobwhite quail, coyote, duck, and goose. Illinois Hunts Select the desired species & weapon below and click "Go"
We offer fully guided and non-guided trophy whitetail deer hunts in Pike County Illinois, Iowa, and Missouri. 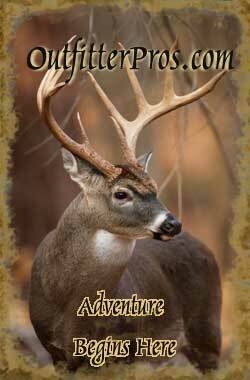 The Midwest's premier Trophy Whitetail Hunting locations. Firearm hunts and Archery hunts are offered on a limited basis to maintain a low pressure hunting environment. Extensive management practices and maintaining year round nutrition with various food plots ensure our Trophy Whitetail Deer and Turkey develop to their full potential. We are now using our same conservation and trophy management techniques to exclusive hunting locations on Iowa and Missouri Trophy Deer Hunts as has been proven on our Illinois Deer Hunts. Lodging is provided with all hunts in two main lodge facilities and other locations offering group privacy with full house keeping. We are a quality Illinois, Iowa, and Missouri Trophy Deer Hunting Outfitter offering a high rate of success. Your Success Is Our Highest Goal With A Quality Hunting Experience.